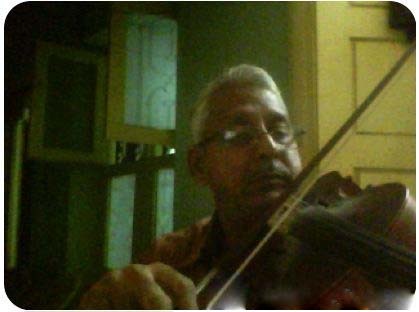 Meet "Suresh" from Fiddlerman's "Fiddle Talk" forum | LEARN TO PLAY THE VIOLIN FOR FREE! • Please begin by telling us anything you would like to about yourself. Age, place of birth, residence, etc. 63 years – Madurai, India – Tuticorin, India. • What made you decide to play the violin? When I was 12 years old, for the first time, I attended a live carnatic music concert and there I was attracted by the violin. • How long have you been playing the violin? Since August 12, 2010. • How often do you play? How long are your practice sessions? Before February 2012, I was practicing a total of an hour every day. Now I practice 3 hrs a day. • In your opinion, what’s your proficiency on the violin? If there is an Intermediate and Advanced category in the Beginner’s section, I may be classified under Advanced Beginner category. • Your greatest personal experience with playing? It happened one day in May 2012. My violin came alive. I could generate sweet sound and was smooth to play and I wanted to go on and on and on..
• What other instruments do you play? I don’t play any other instrument. Thinking of taking up flute. • What does music mean to you? I need air to breathe, water to drink and music to hear and feel. • How do you warm up? I play the open strings and then one or two scales and a very well known piece…all consuming nearly 45minutes. • What is your favorite type of music? Classical music in Western, Carnatic and Hindustani. • What is your favorite piece of music? Why? Beethoven’s violin concerto Op. 61; The opening drum beats and the 3rd movement transports me to a new world. There are other pieces as well. • What are your 2 favorite things to do other than playing violin? Reading books and listening to music. • Are you a member of any orchestra? I hope to be a member in another 100 years. • What do you work with? I am a retired banker. • Would you please share with us information about your violin and bow and if you have several please tell us about them as well. Mine is a Granada MV888 violin, made in China. It cost me $100. I am using the heavy bow that came with it. I like my violin and the bow.